GAMCA abolished per RA 10022 which amended RA 8042 or the Migrant Workers' Act. 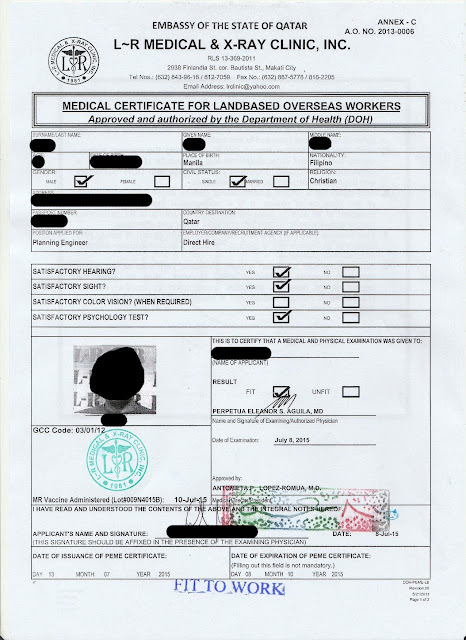 (1) No group or groups of medical clinics shall have a monopoly of exclusively conducting health examinations on migrant workers for certain receiving countries. (2) Every Filipino migrant worker shall have the freedom to choose any of the DOH-accredited or DOH-operated clinics that will conduct his/her health examinations and that his/her rights as a patient are respected. 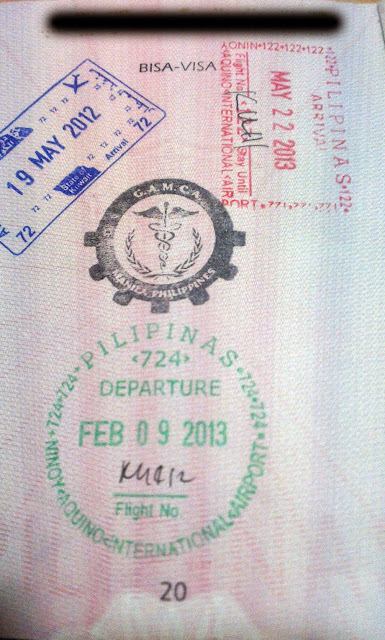 (3) All DOH-accredited medical clinics, including the DOH-operated clinics, conducting health examinations for Filipino migrant workers shall observe the same standard operating procedures and shall comply with internationally-accepted standards in their operations to conform with the requirements of receiving countries or of foreign employers/principals. (4) Any foreign employer who does not honor the results of valid health examinations conducted by a DOH-accredited or DOH-operated clinic shall be temporarily disqualified from participating in the overseas employment program, pursuant to POEA Rules and Regulations. 1. nurse station; blood pressure and basic information (5 mins). 2. laboratory; blood extraction (must have 12 hours fasting), stool (bring sample) and urine (on-site sample) (5 mins). 3. chest x-ray (5 mins). 4. dental exam (5 mins). 5. optometry that includes visual acuity, near vision and color blindness (5 mins). 6. physical examination that includes wearing-off pants, underwear and other advance health questions (5 mins). 7. psyche test that includes abstract questions (1.5 hour). What if you have scar on the lungs? US there any chanceto be fit if the findings are negtive its only scar already? @Muhammad Abdullah; Unfortunately there is NO chance to be fit even if its just a history of having scar. Even though it's negative, it is included in infectious disease list. Thanks for this post. Do you have any idea how long it will take for the medical results to come out? And as a direct hire for Oman, am I allowed to get my medical results? 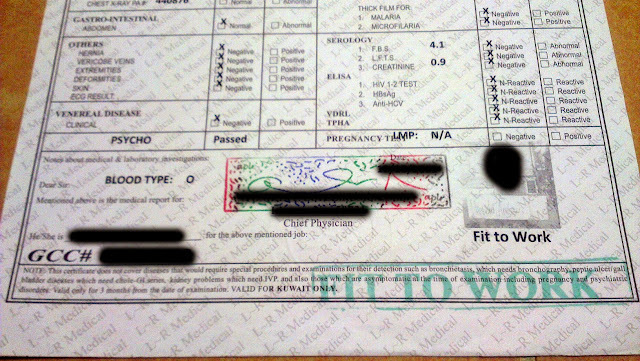 (last time I processed for Saudi, the clinic directly gave results to the agency). @Allan Yasser; I think the standard queuing is 1 week (depends, sometime you have to retake some medical areas for clarification or confirmation). Can i medicaly fit ;If I have scoliosis ? @remyanthomas; if the clinic declared immediately you are unfit, then ask justification even though this deficiency is not in the list. If the clinic provided reconsideration, then its up to your employer to decide if they will declare you fit with waiver or not. I have dextroscoliosis.. Does it make me UNFIT? @Angelica; in my honest opinion, it falls under non-infectious category which means unfit, unless your employer sent a waiver that dextroscoliosis does not affect your work. In my opinion for scar, if Lung Center of the Phils says you are fit to work, GCC countries should abide that. Or perhaps some infectious category from the list should now be remove by GCC countries like history of scar, as it is not infectious disease per se. No, even if the Lung Center of the Phils. says you are Clear of the scar & Fit To Work, the employer has the right to reject possible employment at their own discretion. The best thing to do is to remove scar in the list as INFECTIOUS DESEASE esp.if you don't have any history of TB. it still subject to your employer's decision. Hi. I just had my xray stating that I have a mild blunting of left CP angle, minimal pleural thickenign or effusion. It has the adjectives "mild" and "minimal" though. Can it be waived by my company? Or should I have a medical clearance issued by Lung Center? thanks. I want to know if there's a chance to work in Saudi Arabia am applying as a Sales Lady but the main thing my concern is in my xray recent result I have Stable Fibrotic Residuals in the Left Apex compared to 7-16-16 & 4-4-14 exams.No new Infiltrates seen. What am going to do? Do i need for waiver? 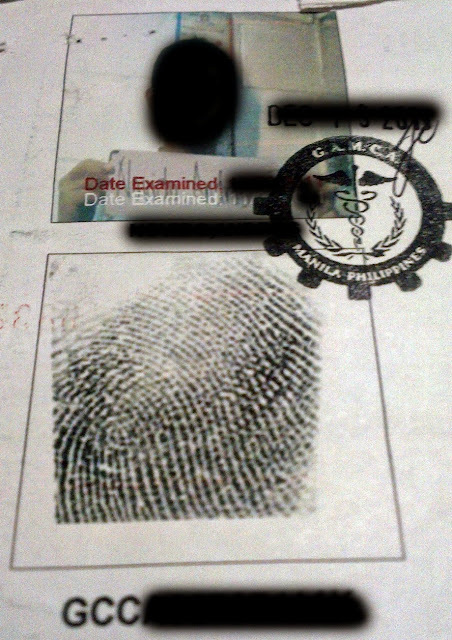 usually po pag may any negative findings sa x-ray, magpa-2nd consultation po kayo sa ibang x-ray clinic... Again, depende po sa company na magha-hire sa yo, pwede silang mag-issue ng waiver sa clinic para makapasa ka. I have a job offer from Bahrain, nagkaroon ako ng TB last 2016 but treated na and I have certification na complete ang medication at ok na ako. Would a waiver from my employer be able to help me to get a FIT TO WORK in GAMCA? or ok na ang certification? Thanks! Yes, employer waiver ang magpapa-FIT TO WORK sa yo. Yung certification syempre yang back-up evidence mo sa employer mo para bigyan ka nya ng waiver. Goodmorning. I have a job offer in bahrain. I had clear xray and negative AFB test but was PPD(mantoux test positive). Is there a chance that i will be fit and be considered by the employer? Has there been a case that they accept and just do preventive oral treatement in bahrain? 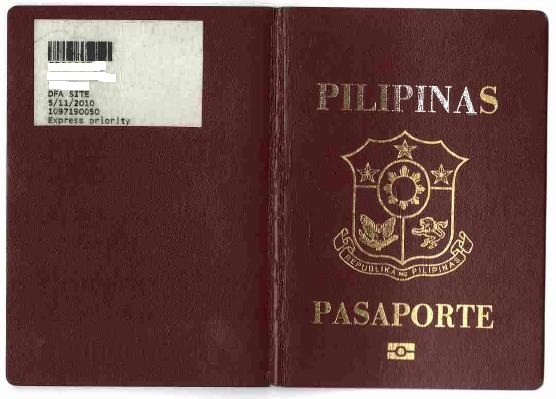 wala pong renewal natural, kuha po ulit ng bago. For overseas bound to Kuwait, applicable pa din po ba ang GCC na accredited clinic lang pwede magprocess ng medical or any DoH pwede na? Do you have an idea of the exact diagnostic tests needed for Kuwait? Thank you! yes, applicable pa din, test above generally lang po unless you declared something unusual. I am a mechanical engineer, recently I got a job in al-khobar Saudi arabia. when I go for gamca medical centre in new delhi for medical checkup my report is ok but I have no vision in my left eye ,right eye vison is normal(6/6). they told me according to us you are unfit but we did not give you unfit report, you can try at another medical centre . my travel agent also said you are unfit but a Mumbai travel agent told me if you transfer wakkala to my agency I will stamped your visa . So did u check in other clinic?because I have same problem and got job at Abu Dhabi as sports trainer. Will operations (done in past) of neurological problems declare unfit for medical? Hi! I just want to clarify lang po, UAE employers have the right to issue waiver para maging fit ka in case na makitaan ka ng lung scar? Tama po ba? yup, not a right and compulsory, it's still up to them if they will issue or not. On my case, yung agency mismo ang nag-waiver kasi alam nila not related and case ko (semi-color blind) sa work ko. Ah. Thank you for this! Nice blog, btw. Very informative. I read this article. I think You put a lot of effort to create this article. bal bhawan mayur vihar I appreciate your work.